The French documentary film Le Système Octogon is based upon the thesis formedby two investigative journalists (Fabrizio Calvi and Frank Garbely) who suggest that as World War II drew to a close a significant amount of Nazi gold was hidden away only to resurface – after the war had ended – to help fund the German political party, the Christian Democratic Union and to have further wide-reaching influences within political circles over the decades after the war. A major part of the network, the “Octogon Trust” was a front company set up by an arms dealer and it functioned as the channel for this secret funding. Using archive footage from the remnants of war-torn Germany, plus photos and expert interviews, director Jean-Michel Meurice weaves a narrative that describes the extent of this far-reaching corruption and details the role former Nazis and the Nazi finances played in the whole system. Contemporary jazz composer Patrice Mestral has provided music for over twenty scores for film and television spanning over 40 years. 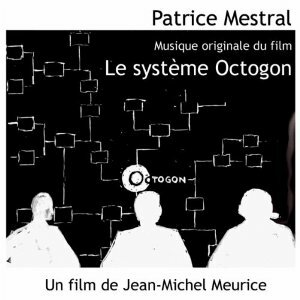 For Le Système Octogon Mestral has composed an orchestral score that succeeds in adding an oppressive and somewhat bleak quality to the documentary. Scoring the archive, newsreel-type footage, Mestral has chosen to leave the interviews with various experts free of music. Covering the years immediately after World War II through to the building of the Berlin Wall in the early 1960s, punchy brass figures, staccato string patterns, dissonant and discordant passages with unsettling textures all build a sense of unease. Archive film of bombed cities (“Allemagne Année Zéro”), helpless refugees and even footage of anonymous people doing mundane tasks (“Les Nazis Se Recyclent”) are all given a sense of hopelessness with Mestral’s overarching commentary. There is very little in the way of optimism here, though there are a few passages where the composer relies on his jazz roots to add some variety to the score (“Rapport Secret”, “Vers La Guerre Froide”): an animated reconstruction of a supposed meeting in 1944 between German industrialists, bankers and military officers seeking to protect the financial strength of the Reich features a jazz ensemble that gives a seedy colour to the sequence (“Rapport Secret”). This sequence also highlights one of the few parts of the film where the music becomes a dramatic tool, mirroring the on-screen events. Other examples include brisk, insistent strings to serve as a musical reinforcement of urgency and speed in an animated car journey (“Transfert de Fonds”) and as a dramatic accent to footage of a building inferno (“Berlin 1953”). As well as the constancy of the overall tone of the music itself, Mestral has also composed a theme that can be heard throughout the score, either in its entirety or as brief fragment statements. After a series of dissonant chords, the score opens with a dramatic statement of this theme in a style that puts me in mind of the horror films of the 1930s and 1940s (“Octogon (Générique)”). Snatches of the theme played by various sections of the orchestra helps bind the score together and reinforces to the listener the early beginnings of the Octogon network as the various Nazi protagonists are presented and the various (and at times complex) strands central to the documentary are laid out for the viewer (e.g., “Les Nazis Se Recyclent” and “Ruschewegh, Le Diplomate”). Mestral’s score for Le Système Octogon is not an easy listen but for anyone who enjoys challenging music or who has a liking for modernistic writing will find the score rewarding. Having watched the documentary, the music does add a significant aspect to the film and the film’s producers’ choice of keeping the interviewed segments free of music is what would be expected in a documentary film such as this. Dramatisation within the film is kept to a minimum (a refreshing change compared with most modern documentaries) and this is reflected in the music. It’s a score based predominantly on mood and I think that it does a good job at supporting the visuals as well as the overall subject matter. Le Système Octogon is available at most online digital stores. Audio samples can be found HERE.